It should be a dual band transceiver with wide band receive capabilities. FCC Approved on 15 February 2007. Wide Band Receive, including AM broadcast, WFM radio, air, weather. I'm hoping/guessing you can admire this new radio at the Dayton Hamvention. A call to Yaesu/Vertex yielded a confirmation of this radio, but nothing further was know at this time as far as release dates and or pricing. Can't wait untill this radio is sold, i'll try to be one of the first owners! 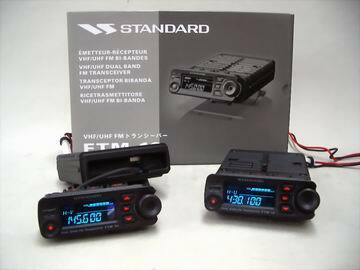 These are pictures of the NEW Yaesu/Vertex FTM-10R (Click to enlarge). Specifications are subject to change without notice, and are guaranteed within the 144 and 430 MHz amateur bands only. Frequency ranges will vary according to transceiver version; check with your dealer. (C) Vertex Standard Co., Ltd.